Charles meets Cindi Harwood Rose, the world’s fastest silhouettist, and prepares to duel. The editing process culminated in a private screening of the still-unfinished film in my studio, to a select audience of artist friends. This turned out to be an important final stage. They gave us some fairly direct feedback, which we took on board, and which resulted (I think) in a much better film. I am happy to report that the film is now finished and ready to show. The hunt is on for a TV sale. Do you, by any chance, know any TV executives interested in quirky and original arts-type documentaries? If so, an introduction would be much appreciated. The current final cut is a festival cut, however the film can easily be lengthened or shortened to fit TV schedules. In the meantime we plan to enter the film to a number of film festivals. 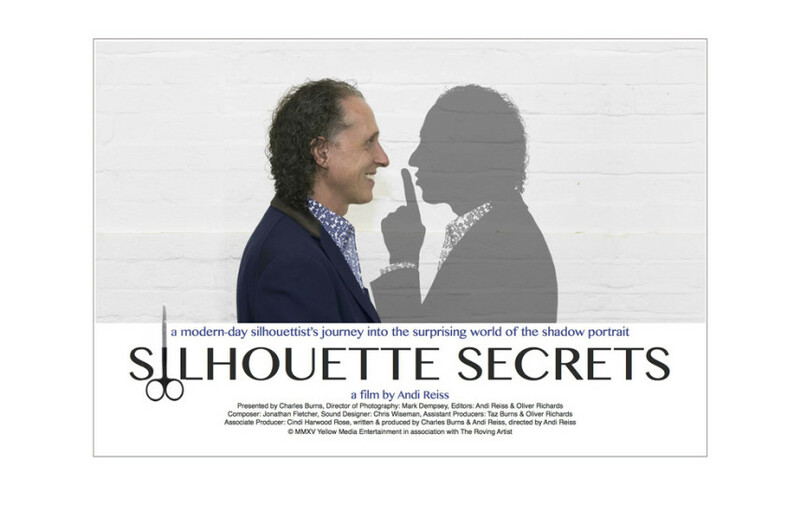 We’ve already had our first success: Silhouette Secrets has been accepted for screening at the Marbella Film Festival (7 – 11th October) where it’s been entered into the Best Documentary section. Would you like to join us there? If you know anybody in the area do please forward this email to them. If we are successful there – next stop, Cannes! 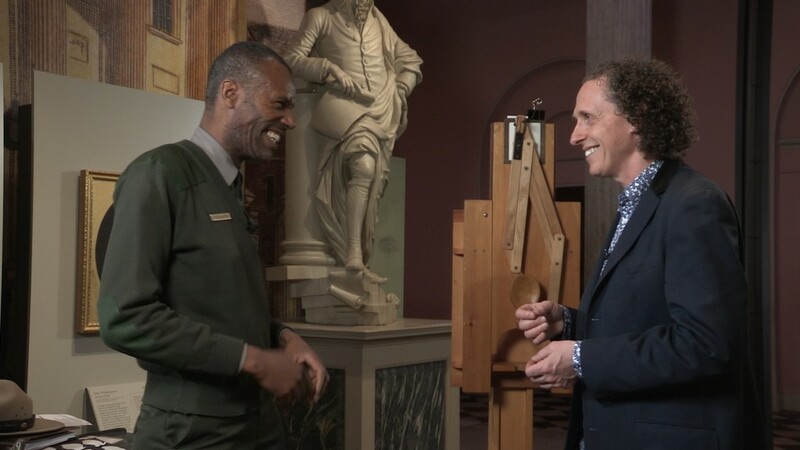 Charles gets a lesson in how to use a nineteenth-century silhouette-making machine, known as a physiognotrace. Making a film has been an unexpectedly wonderful experience, taking me well outside my comfort zone. I’ve loved every minute of it, from finding myself in front of a camera for the first time, to the long hours spent in the editing suite. As well as the film we’ve made a number of short “Silhouette Snippets” which will be released to the film’s Facebook page over the next few weeks. One of these snippets – made from off-cuts of the film – has been turned into a 3-minute promotional video for The Roving Artist and will soon appear on the front page of my new website. I will let you know how we get on in Marbella. In the meantime I am open to suggestions for private screenings – either on their own or as part of a larger event – perhaps combined with a talk on silhouettes or a silhouette workshop. Please do get in touch if you have an event coming up where this might work. As usual I will be on The Roving Artist stand at the Square Meal show in Old Billingsgate later this month (23rd & 24th September) so do pop by if you want to talk more about the film, or any other aspect of my work as a silhouette artist. film festival – lets hope it wins first prize! Intruiged! I look forward to seeing this – keep us posted ! How inspiring to see an Artist at the Peak of their craft. Enyone considering taking up silhouette cutting would not fail to be captivated by Charles’ enthusiasm and accomplishment. One wonders Charles if you had any notion, when cutting your first ever silhouette, where it would lead and the creative Journey that followed! Good luck with the New book Charles, and I’m sure it won’t be too long before we watch your film on the BBC. Ps The new Web site is a joy to visit and a credit to your work and achievements. Thanks Patrick. In answer: no I had no idea at all. 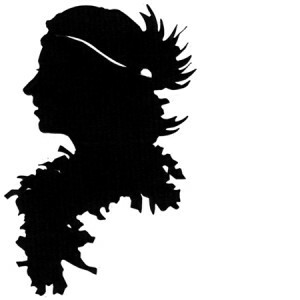 My first silhouette was cut of my wife, Kazumi, shortly before the birth of our first child. Really wishing the film well! We were “silhouetted” at a wedding last year – it was such a lovely thing to do and we now have an exquisite memento of the event. There is always a lot of hanging about at weddings isn’t there and making small talk with a mixed assemblage of people is great as far as it goes. Having Charles working through the gathering, his quick fingers and keen observation of his subject making it a delight to watch. Thanks for making the day so special for all of us. I have responsibility for organising a Conference this year and I am looking forward to Charles working is magic with the crowd gathered to talk about people. I can’t think of a more fitting addition to the programme. Any more news about the film and whether and when it will be televised? I am greatly looking forward to seeing the film. I had the honor of having you cut my silhouette in Baltimore when you stayed at my place – Lancaster House – while working on it. I was very impressed with your fine artistry – especially since we were in Bertha’s Pub drinking beer at the time! Thank you again for your hospitality, to me and all the Silhouette Secrets crew. Beer and scissors is not usually a good combination, but it was an exceptional occasion. I’m happy to hear the silhouette was a success!